The tradition is that the Tuesday before Lent is a time to indulge or Fatten up before tightening belts and giving up things for Lent, which starts on Ash Wednesday. It is the Fat Tuesday associated with Mardi Gras and it is the Shrove Tuesday associated with Pancake Suppers or Pancake Day. This Tuesday February 13th is also Paczki Day, a Polish tradition of making and eating Paczki the day before Lent starts. 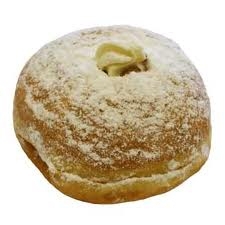 It is best to get there early – They start making them a few weeks before Paczki Day, so they should have them NOW! I got there on Fat Tuesday last year at noon and they only had 5 Paczki Left! This entry was posted on Monday, February 11th, 2013 at 4:15 pm	and is filed under Silver Spring Businesses. You can follow any responses to this entry through the RSS 2.0 feed. You can leave a response, or trackback from your own site.